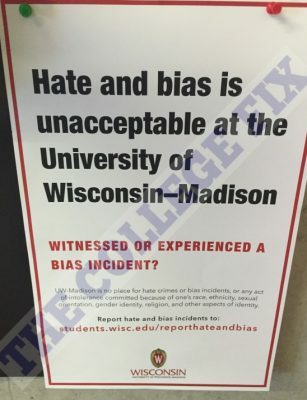 For the last two months, University of Wisconsin Madison student Daniel Dropik has asked permission from several department heads to post flyers questioning the institution’s new diversity and inclusion initiative. So far, Dropik’s been denied – every single time. The official reason he has received from numerous administrators is that his flyer cannot be posted because it’s “political in nature,” Dropik told The College Fix in an interview. Is “Hate and Bias” Really Unacceptable? 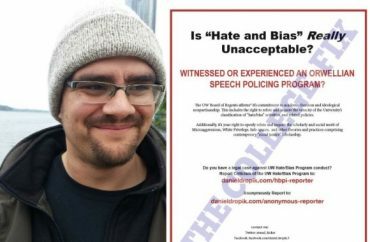 WITNESSED OR EXPERIENCED AN ORWELLIAN SPEECH POLICING PROGRAM? The UW Board of Regents affirms* it’s commitment to academic freedom and ideological nonpartisanship. This includes the right to refute and inquire the veracity of the University’s classification of “hate/bias” activities, and related policies. Additionally, it’s your right to openly refute and inquire the scholarly and social merit of Microaggressions, White [Privilege], Safe-spaces, and other theories and practices comprising contemporary “social justice” scholarship. Dropik, a computer science major, told The Fix his flyers are somewhat tongue in cheek. His goal, he said, is to elevate the tone of campus discourse by clearing the air of political correctness and engaging with others in honesty and openness. “Students can disagree about what should be classified as hate and bias. That dialogue is such an important part of good race relations,” he said. Dropik said prior to posting any of his flyers, he went through the proper channels to follow campus posting policies. 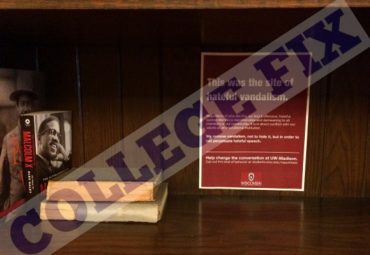 Since every campus official denied him permission, his flyers have never seen the light of day at UW-Madison. Students are apparently not free to voice such disagreements at UW-Madison, the state’s flagship university, which just launched a massive and controversial new program called “Our Wisconsin” that aims to crack down on offensive words. 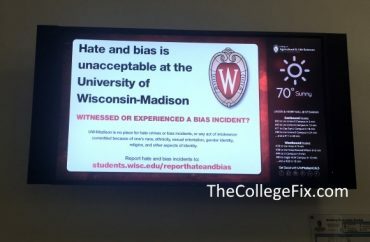 But Dropik and others say they are not convinced by the UW’s arguments, and worry that the Our Wisconsin program—which encourages students to report on one another anonymously, thus initiating a secret investigation by a “hate and bias incident response” squad—is merely a tactic for further stifling free expression on the Madison campus. For Dropik, who has tried to engage the university in a conversation about the Our Wisconsin program, the issue of free speech and respectful dialogue is a personal one. As if determined to prove Dropik right, administrators recently set up separate meetings for white people and students of color in the wake of Black Lives Matter violence across the country. While the UW speaks constantly of “social justice,” Dropik adds, it is blind to its own blatant indoctrination and promotion of intellectual homogeneity in favor of cosmetic diversity. “Another serious danger is the ease with which ‘hate and bias’ can be abused to subvert political and ideological opposition, and to institute indoctrination. The balance of the burden is on the accused, and the accuser has no accountability,” Dropik told The Fix. Dropik is not alone in his concerns. Other UW students have taken to Facebook and YouTube to express their frustrations with the UW’s crackdowns on free speech and creation of a program that potentially makes secret informants out of the entire student body. Some UW professors have also voiced their concerns in private, although, perhaps fearful for their jobs, none have yet dared speak out in public. Dropik’s aim, though, is to help other students articulate their concerns openly. Asked to weigh in on the situation, a campus spokesman told The College Fix he was unaware of Dropik’s situation. Officials with the computer science department, Dropik’s home department, did not respond to requests seeking comment. 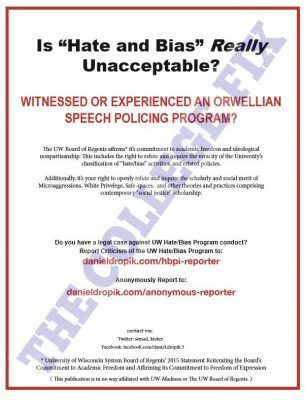 As of this writing, it appears to remain impossible for UW students to post flyers criticizing the very program that encourages them secretly to criticize one another. College Fix contributor Dr. Jason Morgan holds a PhD in history from the University of Wisconsin. He is a research fellow at the Japan Forum for Strategic Studies, and has written for Crisis, Chronicles, American Thinker, Mises Wire, The Remnant, Modern Age, Ethika Politika, and the New Oxford Review. His new book, Amerika ha naze Nihon wo miorosu no ka?, is available from Wani Books in Japan.